The other day I was writing about signage and how people need to be consistent. This is the sign I was referring to. Artistically, it is one of the prettiest campaign signs I have ever seen. Structurally, though, I think it is defective. 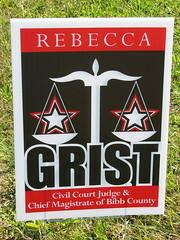 I think the fonts on Rebecca and Grist are the same.